Whenever we attempt to learn something new, we all go through the same stages in developing competency. It doesn’t matter whether it is mathematics, woodworking or skill at arms. Under ordinary circumstances, we can progress at a slow to moderate pace and make satisfactory progress. However, preparing ourselves to carry a concealed firearm is very different. Unfortunately for some, the excitement of getting that permit to carry a lethal weapon can overshadow their objectivity in evaluating their actual competency. When we start out to learn something new, we are often unaware of the vastness of the subject and how little of it we actually know. This stage of learning is called Unconscious Incompetence. When we carry a firearm, this unconscious incompetence can get us killed. Perhaps someone took an inexpensive concealed carry course that covered only the minimal material that the law required (a really bad idea, by the way). Or, maybe they’ve been shooting for years but never sought any formal training. The bad habits they developed over the years went uncorrected because there was no trained, objective evaluator to correct them. Whatever the case, such a person may think that they are prepared to carry because they now have a legal document but, in reality, they are not prepared to carry competently. So they get some training, and instead of scattering rounds all over the target they start to see some groupings appear. About the 10th time their instructor tells them to get their finger out of the trigger guard, they come to the realization that they have much more to learn and many more skills to develop than they’d initially thought. They have now entered the stage of Conscious Incompetency. This is where the serious work should begin. My wife recently asked me, “Do you feel powerful when you carry your gun?” My honest response was, “No, I feel a great deal of responsibility!” Each person who carries a concealed firearm needs to grasp the gravity of what they have chosen to do. Carrying a firearm without having the skill to use it effectively and safely can result in unintended consequences like injured bystanders, legal action and serious repercussions for our families. First, a person in this stage must find a trusted instructor and begin working with them on a regular basis. An objective set of trained eyes can be essential in correcting bad habits, recognizing potential problems and developing effective skills. A qualified instructor will have invaluable experience that will allow a client to avoid training pitfalls and develop good habits. The result will be faster progress in developing defensive firearm skills. A good instructor will also help clients develop muscle memory, a defensive mindset and heightened situational awareness. After getting consistent, supervised training, putting in hours of dry practice, developing mental discipline and building good muscle memory, a client will find themselves able to make good decisions and put rounds on target at a reasonable distance and under stressful conditions. They will have thought through their reactions to numerous scenarios involving potentially violent encounters and will be mentally and emotionally prepared to defend themselves and their loved ones. During practice sessions, they will always demonstrate good firearms handling, proper safety protocol and above-average accuracy. They have now entered the stage of Conscious Competency — they are competent, and they know it. Over a period of time, the mastery becomes more instinctive and requires less conscious thought. They find that muscle memory is so well formed that when they draw the handgun, it naturally points on target. They are constantly aware of their surroundings and observe others for any signs of a threat. They deliberately keep in mind the impact their concealed firearm has on decisions they make, like selecting paths to walk that have the lowest potential for unexpected confrontations, de-escalating situations whenever possible and instinctively protecting their gun side. They don’t have to think twice about leaving their firearm in the car when entering an area where carrying is not allowed. In short, these things are second nature. They have now reached the stage of Unconscious Competency. This is characteristic of true proficiency and preparation for carrying a concealed firearm in any situation. And still, they continue to practice and hone their skills, realizing how perishable these fine motor skills and mental acuity can be. Unfortunately, too few people get the training they need to progress past the first stage. Ego or pride keeps them from acknowledging their need for further training. Thinking they are already competent, they pass up opportunities to improve. They continue to carry without much improvement in their ability to use their firearm effectively. We see people like this at the range far too often. Although few remain in the second stage for very long, many others will find themselves stuck in the third stage because they don’t put enough effort into range time, dry practice exercises, building muscle memory and honing their mental alertness. 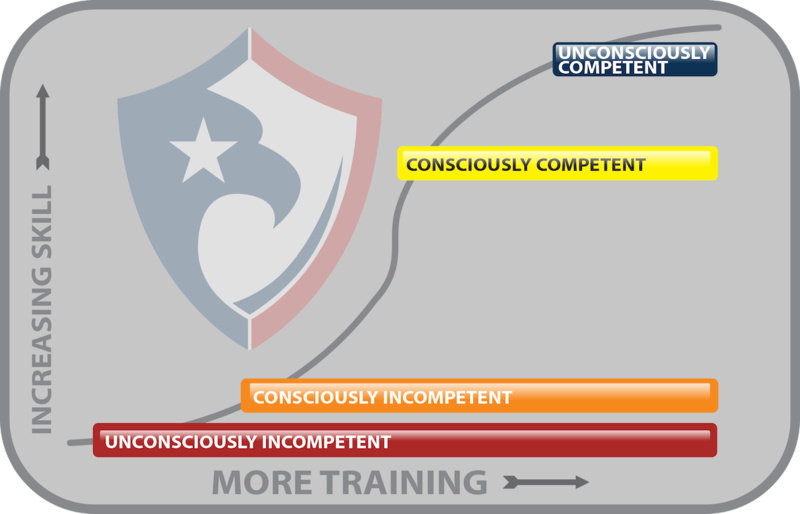 Every person carrying a concealed firearm should be aware of the stage in which they currently find themselves and put appropriate time and energy into progressing toward that last stage of Unconscious Competency. No one, finding themselves confronted with violence, wishes they had spent less time preparing! Agreed, but finding a “qualified instructor” capable of providing invaluable training is more difficult than it seems – for an untrained person they may seem to be “qualified” when they really aren’t. They are far and few between regardless of what they claim. The biggest obstacle, besides leftists politicians that want you disarmed, is the gun range and the unsafe safety rules. No holster is by far the worst idea ever.